The Pavilion range comprises HP's consumer machines and while the Pavilion dv6-3040sa is a stylish and largely usable machine, it unfortunately features some irritating design features and lacks the impressive performance of its Intel-powered peers. 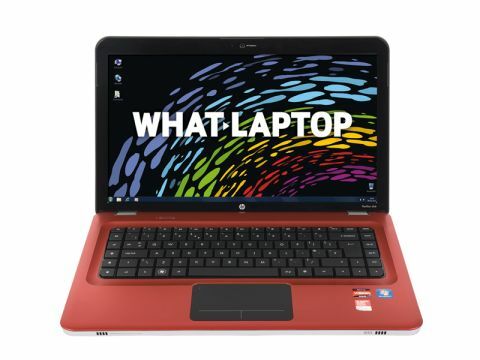 We're big fans of the look HP has gone for – the metallic red finish adds a welcome touch of class. The laptop is also very easy to keep clean, as the matt coating doesn't easily attract dust or dirt and easily repels scratches. We did notice the chassis quickly heats up during use, however. It's not exactly uncomfortable, but is worth noting nevertheless. Build quality is also decent and there's very little flexibility in the chassis' panels, which means the laptop will survive the odd bump on the road. The 279-minute battery life is also impressive for this group and the 2.5kg weight means you won't have much trouble lugging it around. The 15.6-inch screen is bright and clear and will suit those who regularly view photos and videos on their laptop. The Super-TFT screen finish provides vibrant colours, but also produces reflections in bright light. Those looking to avoid this should check out the Medion Akoya P6512. The touchpad is also one of the more irritating we've used and hinders usability quite considerably, so be sure to try before you buy. Processing power is provided by an AMD chip, alongside 4096MB of memory, and although you'll have enough performance for running everyday office applications such as your internet browser, resource-intensive multimedia applications will struggle. Nevertheless for the average user this shouldn't prove a hindrance. The 500GB hard drive is generous and it spins at a very fast 7200rpm, meaning quick access to your data and therefore better performance. The DVD drive also features HP's LightScribe technology. Connectivity is top-notch with both 802.11n Wi-Fi and Gigabit Ethernet in place. There are also four USB ports fitted around the chassis, one of which doubles as an eSATA interface for rapidly transferring data to compatible external hard drives. We have mixed views on the Pavilion dv6-3040sa. It's a great looking laptop with some nice features, but the performance isn't great for the money and neither is the usability, with the touchpad proving extremely frustrating.